You can now export all of your GamePlan scheduling data to Microsoft Excel! This allows you to create custom dashboards showing project information at any level of detail. You can also perform further calculations on the data, such as cost and revenue schedules. From the Reports menu, choose Excel report. An Excel workbook is created. The workbook contains multiple worksheets, with each worksheet containing different data. The workbook’s name is fixed to facilitate linking to the exported data. 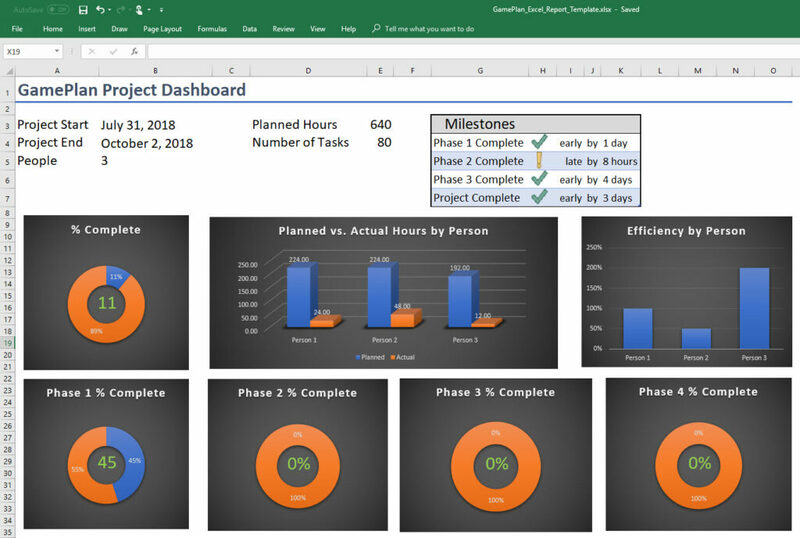 This gives you all the presentation tools in Microsoft Excel to create a custom dashboard, which automatically updates when a new GamePlan report is opened.